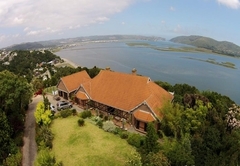 Villa Mulligan is one of the highly recommended Knysna guest houses and provides accommodation in 5 guest rooms for tourists visiting the Garden Route region. 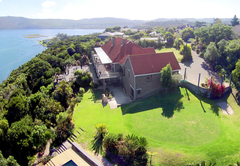 Villa Mulligan is located on the Kanonkop hill, 2 kilometres from the town centre of idyllic Knysna. 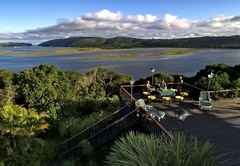 The spectacular view of the Lagoon, Knysna and the Indian Ocean build a breathtaking panorama. The big 10 000 square meter lush garden with the pool invites you to relax. 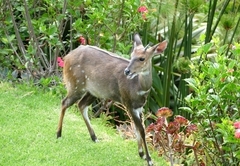 The Bushbuck regularly visit our garden and you can watch the colourful Knysna Lourie and other birds in our trees. 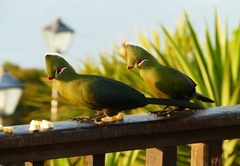 Beautiful endless sand-beaches and ample pristine forests in the vicinity complete the perfect location. 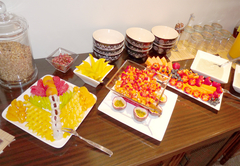 The breakfast buffet offers a delicious variety to fulfil all tastes, fresh fruits, multiple cereals, juices, yoghurt, several cheeses, cold meats, delicious breads and variety of eggs, etc. We are specially proud of our gorgeous cappuccino. 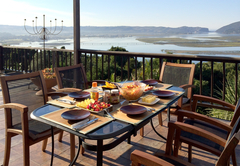 Weather permitting we serve breakfast on the patio overlooking the Lagoon and Knysna. • we have our own large putting-green (150 square meter) and our own practice bunker for those who like to play golf. We love to compete with our guests on the chipping green. 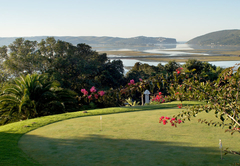 There are many other activities and attractions in and around vibrant Knysna. 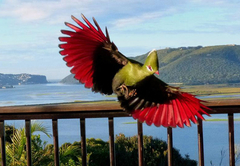 Paragliding, horse riding, canoeing, mountain-biking, diving, sailing, fishing, trekking, surfing, bungee-jumping, whale/dolphin watching, hiking, animal watching, swimming, kite-surfing, lagoon cruises, steam train riding, quad riding .. the opportunities are boundless. 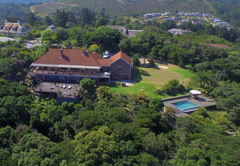 We know the area and we like to assist you with our knowledge. Safe family beaches are nearby. Safe for swimming, great for surfing, good for fishing, wonderful for walking, jogging or horse riding and perfect for simply sunbathing while spotting passing dolphins and whales. 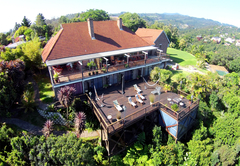 Villa Mulligan Guesthouse is personally managed by the German owners. 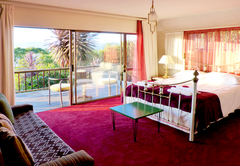 All guestrooms have luxurious en-suite bathrooms, TV and direct access to the 300 square meter deck. 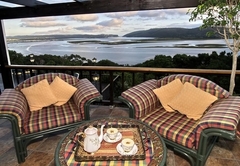 Each room is individually furnished and has superb views of the lagoon and through the Knysna Heads. 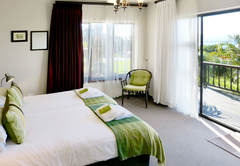 Expect great comfort and attention to detail and a very appealing, welcoming atmosphere. 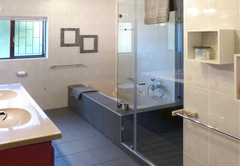 Relax at the pool, get spoiled and enjoy the comfortable equipment and the pleasant atmosphere of the villa. 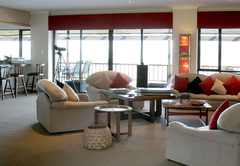 Big Suite with private Veranda with lounge suite and separate dressing room. 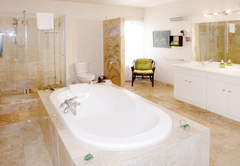 All guestrooms have luxurious en-suite bathrooms, TV and direct access to the 300 square meter deck. 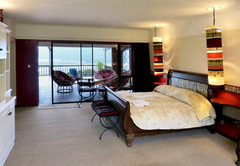 Each room is individually furnished and has superb views of the lagoon and through the Knysna Heads. 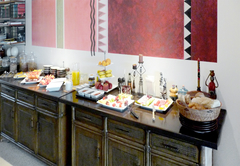 Expect great comfort and attention to detail and a very appealing, welcoming atmosphere. Relax at the pool, get spoiled and enjoy the comfortable equipment and the pleasant atmosphere of the villa. 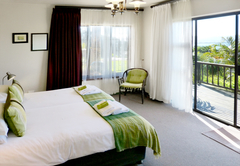 Double Room with extra sleeper couch and spectacular view. 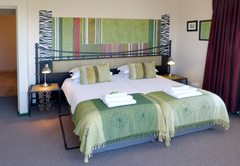 All guestrooms have luxurious en-suite bathrooms, TV and direct access to the 300 square meter deck. 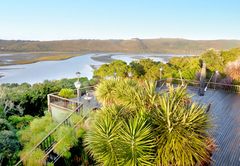 Each room is individually furnished and has superb views of the lagoon and through the Knysna Heads. 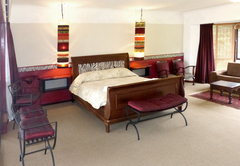 Expect great comfort and attention to detail and a very appealing, welcoming atmosphere. Relax at the pool, get spoiled and enjoy the comfortable equipment and the pleasant atmosphere of the villa. 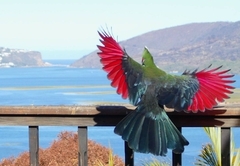 Fantastic stay and view (the best !). The most difficult thing is to leave this place. I wished we could have stayed longer. This place is a absolut winner. But there is much more than the perfect view. The good company, good advice and help and first class hospitality have been a great pleasure for us.